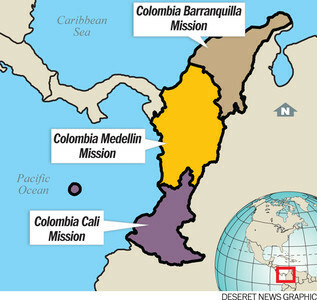 Eight new missions of the Church are being created in Colombia, Ghana and Mexico; in the region of Vanuatu, New Caledonia and the Solomon Islands; in Utah and in Nevada. A mission in Moscow, Russia, is being combined with neighboring missions. Following is a rundown of the changes, which will be effective around July 1, when mission leadership changes occur. Please refer to the accompanying maps for new mission boundaries.